Appearance - Bed bugs are small, usually only 4 - 5 millimeters in length. They have flat, oval shaped bodies. Bed bugs are usually light brown or reddish brown in color but will have a bright red abdomen immediately following a meal. Behavior - Bed bugs leave straight rows of small itchy bumps on your body. Bed bug bites can cause itchy spots which can lead to infection if continuously scratched. Bed bugs can also bite pets in the home. Some people may not react to bed bugs bites, so while one person sleeping in an infested bed may show bites, another may not. Carefully check your bedding, take off all sheets, and inspect the mattress, paying close attention to the seams. If you see small rust colored, black or brown spots, these may be bed bug droppings. Bed bug droppings are made of digested blood, usually about the size of a felt tipped marker dot. You may also see bed bug skins that have previously been shed. Bed bugs can survive for up to a year without feeding. There are many different ways you can get a bed bug infestation in your home. Contrary to popular belief, bed bug cases do not just affect people in unclean living conditions. Purchasing pre-owned furniture, travel, and unknowingly visiting an affected home are common origins of a bed bug problem. In apartments, often one apartment with a bed bug problem can spread the bugs to neighbors. Do not feel embarrassed about a bed bug infestation. Many times it is beyond your control. We are here to help make sure your home will be bed bug-free by the end of our bed bug treatment. 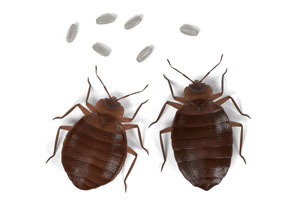 Bed Bugs begin to multiply in your home if you do not treat quickly. More bed bugs mean more bites, greater chance of spreading bugs to your family and friends, and a more difficult time getting rid of a bigger infestation. Our bed bug treatment addresses both live bed bugs and any hidden bed bug eggs. By calling our trusted company, you are taking the first step to reclaiming your and sanity from a bed bug problem.